Go for a swim over in Brooklet Hill and complete another step on your journey to become a true Pokémon master in Pokémon Ultra Sun / Ultra Moon as we continue the walkthrough guide. 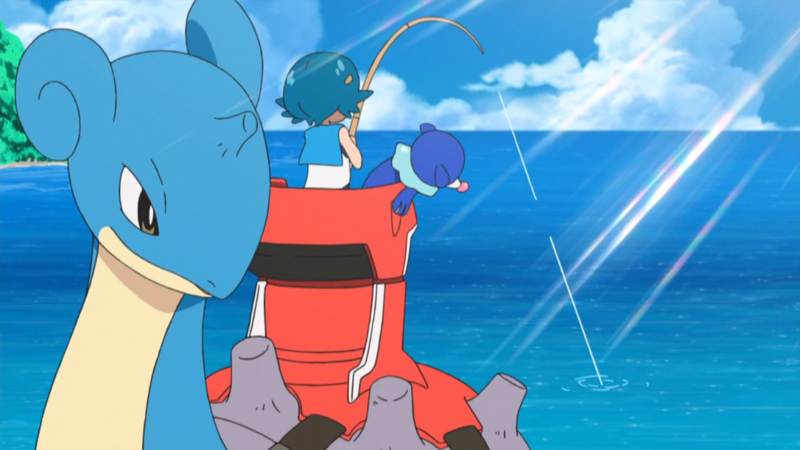 In Part 3, we’re going to Captain Lana’s Trial, and this one is all about fighting water type (and bug type) Pokémon. Arm up with Bird Type and Grass Type Pokémon to make battles easier, and try to avoid bringing Fire Types that’ll just get doused. Lana’s Trial is about Level 18-20 — even if you don’t have the right types of Pokémon, you can always over-level in the earlier routes. This trial is located on Brooklet Hill, north from Paniola Ranch on Akala Island. When you land on Akala, you’ll start at Heahea City. Follow the straightforward path up through Route 5 to reach Brooklet Hill. Lana, and the Pokémon you’ll have to fight, are all Water Type. Water-type Pokémon are weak to Electric and Grass Pokémon. Find lots of Grass Types in Route 5 — Fomantis is found here. Catch it before entering Brooklet Hill if you want to be prepared. Alternatively, return to Hau’oli City to catch a Pichu or Magnemite in the grassy fields around town. Don’t forget to stop at the PokeCenter outside Brooklet Hill before venturing into the trial. When you’re ready, go inside and prepare to investigate. Talk to Lana across the bridge when you enter Brooklet Hill to start her trial. She asks you to herd Pokémon downstream to try and lure out a Totem Pokémon. That’s right — there’s a tough Totem Pokémon waiting at the end of this trial. NOTE: For starting this trial, Lana will give you the Lapra Ride Pager! Use it to ride Lapras through the water. You can always swim with Lapras in the right areas. Follow Lana down to the water and she’ll point out two splashes in the water — that’s where the Pokémon on. Ride your Lapras over and defeat both. Don’t try to capture them! They’re both a breeze, so there’s no reason to cover fighting them here. Interact with the water and you’ll get the option to ride Lapras. The goal here is to fight and defeat Wishiwashi. You may encounter Dewpiders, though. If you selected Rowlet at the start of the game, this trial should be a breeze. If you picked Litten, you might want to swap them out for someone else as your starter in battle. When you defeat Wishiwashi, they’ll retreat downstream. Follow them and check out the water splashes to fight them again. You’ll need to cross the lake with Lapras, then return to dry land to reach the lower pond where Wishiwashi ran off to. Fight the tiny Wishiwashi twice, then go down to the Totem Den. NOTE: Land on the optional shore at the second pool (second Wishiwashi fight) to get TM57 Charge Beam. Going down to the bottom of Brooklet Hill, you’ll enter the Totem Den. Jump onto Lapras and you’ll encounter a super-sized version of Araquanid that’s much, much tougher than your previous basic battles. The Araquanid is a Bug / Water type, so Grass and Flying types will make this much easier. Beware bringing in a fire type — water-based attacks will hit those Pokémon hard. Rowlet is an ideal character here, but any Grass, Flying, or Electric types will do. The Araquanid will summon a Dewpider as an ally. When it’s low on health, it will also summon Masqurain. The rain effect is permanent during this battle. Thankfully, Araquanid will only summon each ally once. If you defeat them, it will not summon the same ally again. Once you complete the trial, Lana will reward you with Waterium-Z, a Fishing Rod key item (for capturing water-based Pokémon) and 10 Dive Balls.